SculptureCenter, in collaboration with the Vera List Center for Art and Politics, is thrilled to continue the artist-led lecture series Subjective Histories of Sculpture. This program, initiated in 2006, furthers the exploration by both institutions of how contemporary artists think about sculpture: its history, legacies, and potential for innovation. This year, SculptureCenter with the Vera List Center presents two artists to consider the thematic focus of alignment. 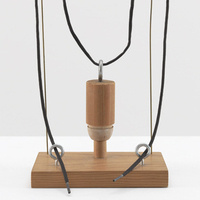 Utilizing sculpture as a point of departure and source of inspiration, B. Wurtz and Araya Rasdjarmrearook consider tensions and translations between the animate and inanimate, and the empirical and the subjective. Engaging with a rich collection of social, cultural, and political associations, these artists explore the material conditions of our lives and ask how we can re-think official narratives and systems of knowledge. Citing specific works, texts, and personal anecdotes taken from inside and outside cultural production, these subjective, incomplete, partial, or otherwise eclectic histories question assumptions and propose alternative methods for understanding sculpture's evolving strategies. B. Wurtz was born in 1948 in Pasadena, California. He received a BA from University of California at Berkeley in 1970 and a MFA from California Institute of the Arts in 1980. His work has been exhibited at MoMA P.S.1, New York; Abrons Art Center, New York; MCA Chicago; Musée d’Art Contemporain de Lyon, France; RISD Museum of Art, Providence, RI; Museums of Bat Yam, Israel. SculptureCenter at The New School is organized by the SculptureCenter in collaboration with the Vera List Center for Art and Politics. Image caption: B. Wurtz, Shoelace, 1995. Wood, metal, shoelace, 12 x 6 1/8 x 5 1/4 inches. Courtesy the artist and Metro Pictures.